Genotype to phenotype. Recurrent microdeletions at various sites in the human genome are known risk factors for a broad range of neurodevelopmental disorders including epilepsy, autism, intellectual disability and schizophrenia. Despite the fact that the pathogenic role is well established, the mechanisms linking the microdeletion to the neurodevelopmental phenotype remain obscure. In contrast to monogenic disorders, various genes are included and functional studies are difficult. Now, a recent paper in Cell examines the role of a specific microRNA that is dysregulated in the 22q11.2 microdeletion. The results are surprising. The 22q11.2 microdeletion. The 22q11.2 microdeletion is one of the “neurodels”, recurrent microdeletions, which occur at default breakpoints of the human genome and which have a broad phenotypic range. The classical phenotype of this microdeletion is DiGeorge syndrome, characterised by cardiac defects, immunodeficiency due to aplasia of the thymus and hypocalcemia. DiGeorge syndrome or its phenotypic variants are also referred to as velo-cardio-facial syndrome (VCFS), Shprintzen syndrome, conotruncal anomaly face syndrome or Strong syndrome. Many patients with the 22q11.2 microdeletion have cognitive deficits. In addition, the 22q11.2 microdeletion has been found to be a strong risk factor for schizophrenia and it can be identified in some patients with Idiopathic Generalised Epilepsy, mainly Juvenile Myoclonic Epilepsy. An animal model of the 22q11.2 microdeletion shows abnormal neuronal morphology. 22q11.2 and microRNAs. In addition to the ~30,000 genes in the human genome, there are probably more than 1000 microRNAs (miRNAs), short non-coding RNAs that can have a profound effect on gene expression. A single miRNA can usually affect the gene expression of multiple target genes. This is the reason that miRNA dysregulation is an interesting candidate mechanism for a broad range of disorders. For example, in epilepsy, downregulation of miRNA-134 has been shown to suppress seizures in animal models. In many known microdeletions, miRNAs are affected. Deletion of one copy of the miRNA with subsequent lower expression can have a wide-ranging effect. miR-185. In their recent paper, Xu and colleagues investigate the role of microRNA-185 (miR-185), which is included in the 22q11.2 microdeletion. In a previous study, they were already able to show that some of the phenotypes in the 22q11.2 animal model, specifically altered neuronal morphology, could be traced back to this microRNA. They find that expression of miR-185 in the 22q11.2 animal model is actually much lower than would be expected. Instead of the ~50% reduction due to the lack of one copy, they only find an expression of ~20%. This is due to an interaction with DGCR8, another gene in the deletion region that also impacts on miR-185 transcription. The fact that miR-185 is disproportionally affected by the deletion lead Xu and colleagues to study this microRNA further. Flowchart of the study by Xu et al. The authors investigated the role of miR-185 in the 22q11.2 microdeletion, a microRNA affected by the deletion to a higher extent than expected. One target of miR-185 is Mirta22, which is downregulated due to miR-185 expression. Upregulation of this gene, mimicking the effects of the 22q11.2 phenotype, recapitulates some of the phenotypes seen in the 22q11.2 mouse model. 2310044H10Rik, C19orf63. I agree that it might seem like a cat ran over my keyboard, but these combinations of letter and numbers are actually the symbol of the only gene that is robustly dysregulated in the 22q11.2 microdeletion mouse model. This gene is repressed by miR-185. In the 22q11.2 animal model, gene expression of 2310044H10Rik, C19orf63 is de-repressed, i.e. the gene has a higher expression than in wildtype animals. Given this relationship between miR-185 and this candidate gene, the authors name it Mirta22 (miRNA target of the 22q microdeletion). The human orthologue of Mirta22 is on chromosome 19. In a further series of experiments, the authors demonstrate that the abnormal neuronal morphology observed in the 22q11.2 animal model can also be seen when Mirta22 is overexpressed. Likewise, uncoupling Mirta22 expression from miR-185 by mutating the binding site within the 3’-UTR of Mirta22 rescues the phenotype. 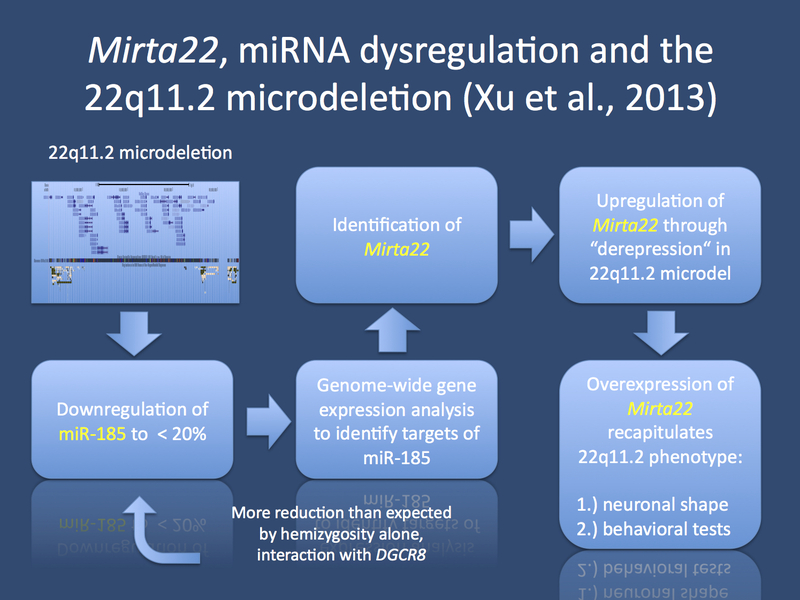 In summary, the authors provide a compelling case that Mirta22 is the main target of miR-185 and that upregulation of Mirta22 is responsible for some of the phenotypes seen in the 22q11.2 animal model. But what does Mirta22 do? Mirta22. The protein encoded by the Mirta22 gene is purely neuronal and located in the Golgi apparatus. Given the widespread expression of this gene and the resulting altered neuronal morphology when this gene is upregulated, it may be assumed that a broad range of protein sorting and transport mechanisms may be slightly altered in the growing brain. This dysregulation then affects the overall morphology of the neurons. Importance for EuroEPINOMICS. There is only limited evidence that mutations in miRNAs can be the primary cause for Mendelian disorders. Nevertheless, acknowledging the fact that exome sequencing has only uncovered a fraction of assumed genetic causes in patients, non-protein-coding elements in the human genome including regulatory elements and microRNAs will receive more attention in the years to come. The paper by Xu and colleagues provides a good example how the functional consequences of these microdeletions can be examined. There are also microRNAs within the 15q11.3 microdeletion (miR-211) and 16p13.11 microdeletion (miR-484) that might be worth examining. This entry was posted in 2013, Papers and tagged 22q11.2 microdeletion, 2310044H10Rik, C19orf63, copy number variation, DiGeorge Syndrome, juvenile myoclonic epilepsy, microRNA, miR-185, miR-211, miR-484, Mirta22, schizophrenia. Bookmark the permalink.